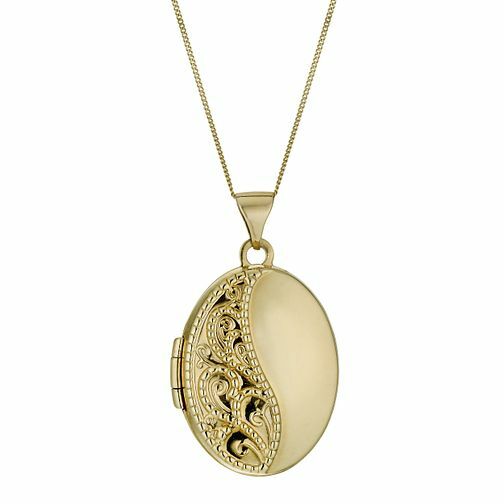 A classic oval locket, crafted from 9ct yellow gold and set on a fine chain. Finished with a swirl of intricate engraving, this is the perfect keepsake to treasure your fondest memory with a photograph. 9ct Yellow Gold 18" Engraved Oval Locket is rated 3.0 out of 5 by 2. Rated 1 out of 5 by Anonymous from Poor quality Received the product and thought the quality is poor, given the cost thereof. Returned it to shop. Rated 5 out of 5 by Anonymous from Good sized locket I was looking for a double photo locket that was big enough to see but not too big that it would dominate my neckline. This is a beautiful, elegant locket that fit my requirements perfectly. It was a little bit more than i originally wanted to spend but i feel its worth every penny. Buy it and you wont be disappointed.